In the last column I outlined how rebreathers work. There are many brands available and more coming on the market though the basic concepts for all of them are the same. Rebreathers are complicated. There are many correct responses for the problems that can develop and it’s also true that many of the reflexes we have developed diving open circuit are inappropriate and can kill us when we are diving a rebreather. When diving open circuit you are virtually always okay if you have gas to breathe. This stops being true when you move into technical diving where breathing your decompression gas too deep can kill you from an oxygen (O2) seizure and breathing your bottom gas for a deep trimix dive too shallow can kill you from hypoxia. When diving a rebreather the gas you are breathing can kill you if the partial pressure of oxygen in the gas is too high or too low, or if the partial pressure of carbon dioxide is too high. Experienced open circuit divers intuitively believe that as long as they have gas to breathe they are okay and as a result often forget to monitor the partial pressure of oxygen (pO2) in the breathing loop on a rebreather. This is frequently a factor in rebreather accidents. In addition, when diving open circuit (no decompression), the ultimate response to virtually any problem is to exhale and ascend to the surface. This is not an option when you are inside a wreck or cave. As well, if you have a significant decompression obligation, ascending directly to the surface can kill you from decompression sickness (DCS). These two situations are often factors in rebreather fatalities. The first rebreather course usually requires a minimum of eight hours in water dive time to allow the student the opportunity to unlearn some of their open circuit habits and to learn a completely new, complex set of rebreather practices. In addition, a significant amount of diving should be done between every course. Rushing into advanced diving using a rebreather is also frequently a factor in rebreather fatalities. Open circuit diving fatalities are usually caused by heart attack, arterial gas embolism, running out of gas or environmental factors (lost, trapped, etc.). In technical diving you also see oxygen seizures, hypoxia and decompression sickness (DCS). When diving a rebreather you see all of the above plus too much carbon dioxide and failure of the rebreather. Let’s look at some rebreather accidents/fatalities. An experienced closed circuit rebreather (CCR) diver made a 300 fsw (90 msw) dive with a 20-minute bottom time. Decompression proceeded normally until the diver experienced a problem during the 60 fsw (18 msw) stop. The diver ascended directly to the surface. This diver’s partner still required approximately an hour of decompression and, wisely, he stayed at depth and finished his decompression. Had he ascended, likely he would have developed serious decompression sickness from which he could have died. The diver who did ascend directly to the surface was recovered almost immediately (unconscious) and was promptly taken to a nearby hospital equipped with a hyperbaric chamber. Unfortunately this diver (age approximately 60, grossly obese, poor physical condition) had suffered a heart attack and was never stable enough to be placed in the recompression chamber for treatment of his serious DCS. He died five hours after arriving at the hospital. During an expeditionary caving trip, a diver died while making a solo dive deep inside the cave. No defects were found with the CCR. He was a newly diagnosed diabetic in denial and in poor control. He almost certainly lost consciousness on the dive as a result of his diabetes, and drowned. A second diabetic on the trip who was in excellent control and who had never had a problem was found unconscious at an underground camp and was revived. When the stresses of daily living are changed, diabetics can very easily lose control of their blood sugars. Another diver was doing his second day of diving on a deep wreck. He jumped off the stern of the boat and was swimming alongside the vessel towards his partner at the down line when he sank directly to the bottom in 240 feet (73m) of water. When the body was recovered several hours later, his computer showed a direct descent to the bottom and no change in depth after that. 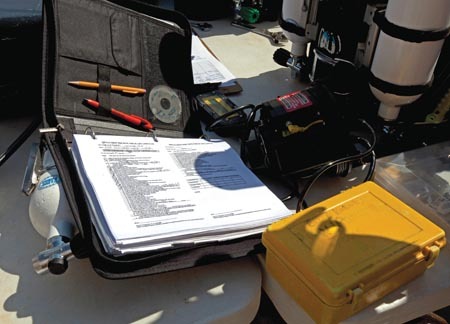 Examination of the rebreather revealed some minor problems that should not have been a factor. Autopsy revealed a serious infection of the heart. This diver almost certainly suffered a cardiac arrhythmia, lost consciousness, sank and died. He was obese, in very poor physical condition and had mentioned feeling a bit unwell the previous day. 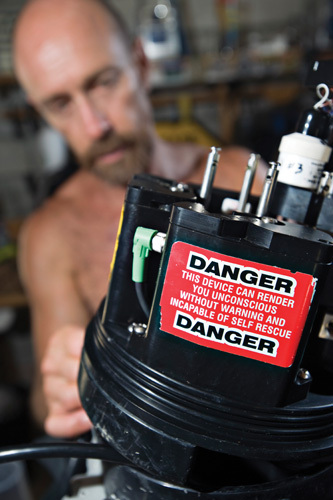 As with open circuit diving, rebreather divers sometimes die as a result of medical problems. On a dive trip to the Galapagos Islands a CCR diver entered the water, was swimming at about 30 fsw (9 msw) depth when he lost consciousness and began sinking, but was rescued by his very alert partner. He was revived, suffered some lung damage from near drowning but survived. He had not properly prepared his rebreather for diving, and he lost consciousness from hypoxia. He had also, obviously, not checked the composition of the gas he was breathing or he would have noticed his pO2 was too low. This diver had thousands of open circuit dives logged and was a photographer, a combination that is often deadly when diving CCR. I firmly believe every CCR photographer should have a partner whose only job is to keep them alive! An instructor was diving CCR while teaching open circuit students in a quarry. They entered the water, descended to about 20 fsw (6 msw), did a few drills then descended to 40 fsw (12 msw). After a few minutes the instructor swam off into the murk. The instructor’s body was later found on the bottom nearby. The O2 tank on his rebreather was turned off. Calculation of his probable O2 consumption, dive profile and rebreather loop volumes revealed that if the O2 tank had been turned off from the beginning of the dive, the pO2 in the loop at that depth would have dropped to a level causing the instructor to lose consciousness about the time he disappeared. He had also, obviously, not checked the pO2 of the gas in the rebreather during the dive. A rebreather diver is trained to check the pO2 in the gas they are breathing every few minutes. A photographer left his dive companions on the bottom at 45 fsw (14 msw) to surface and get more film. His body was found about 45 minutes later on the bottom. Autopsy revealed high levels of stimulants and narcotics. He had a habit of elevating the pO2 during decompression to reduce the risk of DCS. He almost certainly suffered an O2 convulsion as a result of the chemicals in his body and elevated pO2 during his short decompression stop. Increasing the pO2 during decompression at the end of a rebreather dive is a VERY bad thing to do. The body has been exposed to high levels of O2 for the entire dive and is already at risk of an O2 seizure. In addition, increasing the pO2 during decompression has a very small effect on the risk of DCS. Another diver was doing a 130 fsw (40 msw) dive with a long bottom time. While still on the bottom he appeared to become disoriented, made a rapid ascent and sank 12 minutes after surfacing. Although we will never know for sure what happened, the sodasorb in his rebreather was completely expended and it is most likely that he suffered a problem from elevated carbon dioxide in his breathing loop while on the bottom. These accidents all qualify as ‘diver error’, common in rebreather fatalities. A CCR diver made a 160 fsw (48 msw) wreck dive, lost consciousness and drowned. He started the dive with two of the three O2 cells in his rebreather not working. Another diver started the dive with no way to monitor the pO2 in the breathing loop, convulsed during decompression and died. A third made a solo CCR dive with no open circuit options. His rebreather developed a leak in the breathing loop and he died in 16 fsw (5 msw) of water. A rebreather should never be dived without some way to breathe if the rebreather fails (carry a bailout bottle). In these three fatalities there were equipment problems but a properly trained rebreather diver should be able to survive any equipment problem. Another diver did a basic CCR course, a couple of dives then did a deep, solo, CCR trimix dive and never surfaced. A second diver was smoking dope, set up his unit incorrectly and went diving. I would call these fatalities ‘natural selection’. Rebreathers are relatively complicated and the correct response to a problem is less obvious than when diving open circuit. Rebreathers require extensive training and constant vigilance to dive safely. To call them ‘hideous insidious killing machines’ is not completely inaccurate. At the same time, they are awesomely efficient and allow us to make dives that are simply impossible on open circuit. Rebreather fatalities (other than medical problems) are almost always due to ‘diver error’. DIVER MAGAZINE. NORTH AMERICA’S LONGEST ESTABLISHED DIVE MAGAZINE. SUBSCRIBE TODAY.